What is Framing and How Can It Help? Behavioral Economists have studied the effect framing can have on decisions since at least 1981, when Amos Tversky and Daniel Kahneman began to flesh out the concept of framing, or how subjects reacted to various choices in hypothetical life or death situations. How people respond to framing was established with the classic question set that asked people to choose between two treatments for 600 people who were hypothetically affected by a life-threatening disease. Treatment A is predicted to result in 400 deaths. Treatment B is predicted to result in 33% chance that no one would die but a 66% chance that everyone would die. Surprisingly, Treatment A was chosen by 72% of participants when presented with a positive frame — that the participant was saving 200 lives. This dropped to a remarkable 22% when the same choice was presented with a negative frame, or that 400 people will die. The astounding result of this test is that the participants didn’t seem to particularly understand that both the positive and negative framed options provided the same result. Only 200 people were ever going to survive with Treatment A either way. So what does this mean for us? Well it means that people are shockingly susceptible to mild manipulations of statements, and it means that as digital marketers (where the majority of our messages are in text form) we are in a prime position to take advantage of the findings that Behavioral Economics has to offer. Between PPC, CRO, and SEO, there are plenty of opportunities to analyze the effect of language on consumers. While Behavioral Economics provides how things should probably work, we were curious how framing, particularly with the addition of urgency, affects users in the real world. After determining that PPC ads would be the best medium to analyze the immediate effect of framing on behavior, I worked with our talented PPC Analyst Patrick Cusumano to investigate the hypothesis that ads framed as an urgent loss — that the consumer will be missing out significantly by not taking advantage of the offer in the ad — will lead to a higher CTR than ads framed as a very urgent gain or a low urgency loss. We came to this hypothesis for a few different reasons. 1) Prospect Theory, developed by Kahneman & Tversky, suggests a few notions that helped flesh out our hypothesis. First, Prospect Theory shows that a loss is more significant than the equivalent gain, and that a sure gain will be favored over a probabilistic gain. In other words, people want to avoid losing out on something because it will have a more significant emotional impact (you will care more about losing $50 than you will about gaining $50) and that people prefer to know that they will definitely gain something, rather than probably getting something. Finally, Prospect Theory indicates that a probabilistic loss is preferred to a definite loss. This suggests that avoiding definite losses would be preferable to a consumer, so they may favor high gain, high urgency ads, or ads that suggest that the consumer will get some sort of extra benefit, but only if they were to take advantage of the offer within a limited time frame. This can be illustrated in the following graph. Notice that the curve is asymmetrical, and considerably steeper for Losses. This shows that even at a small loss, the value of the loss will inevitably be greater than an equal amount of a gain. 2) There is a significant amount of support from the PPC industry that indicates that users tend to click in particular patterns. Dr. Eric Boyd, of MarketingWhiteboard.com indicates that research backs the notion that PPC ads that are gain-framed tend to lead to higher CTRs than loss-framed ads, until a consumer starts to give more attention to the ad. When the consumer cares more, or wants to give the ad more attention, the CTRs for a gain-framed PPC ad begin to diminish. He also notes that users tend to reward loss-framed ads with higher CTRs and attention when the keyword searched is not in the ad copy. He further suggests that consumers who have a greater interest in a product tend to give more attention to information about the product, which leads to a higher CTR for loss framed PPC ads (vs gain framed ads). The real difference in the effect of the framing, it seems, depends on how emotionally invested a user actually is, and this may be impacted by something as simple as urgency. 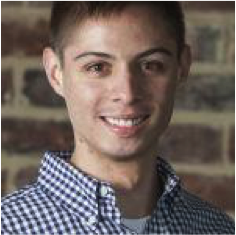 Davis Baker, of Forthea Interactive, presented a similar idea in 2015 when he presented at HeroConf in Portland. In the final stage of his excellent presentation Baker begins to discuss framing and provides a few examples of how to improve your CTRs by tweaking the way that the offer is presented to the user. His advice is simple: when creating an ad, ask yourself “Can I frame the product, service, or proposition in the best way possible?”. He further suggests a few ways to accomplish this, like making the ad a clear gain or loss, using absolute numbers instead of percentages, and to break down the cost of a product. All of these are effective ideas, but he doesn’t exactly approach what we’re most interested in finding. How Does a Change in the Urgency of an Ad Affect CTRs? To answer this question, Patrick & I turned to our Workshop Digital AdWords MCC to look for ads that could help us get to the bottom of this. Our criteria was simple; we needed ads that were selling physical, non-divisible items, and each ad had to have over 1000 impressions. We settled with three clients, and after cleaning through 400+ ads, we narrowed it down to 89 ads with a total of 95,081 clicks and 6,061,222 impressions. 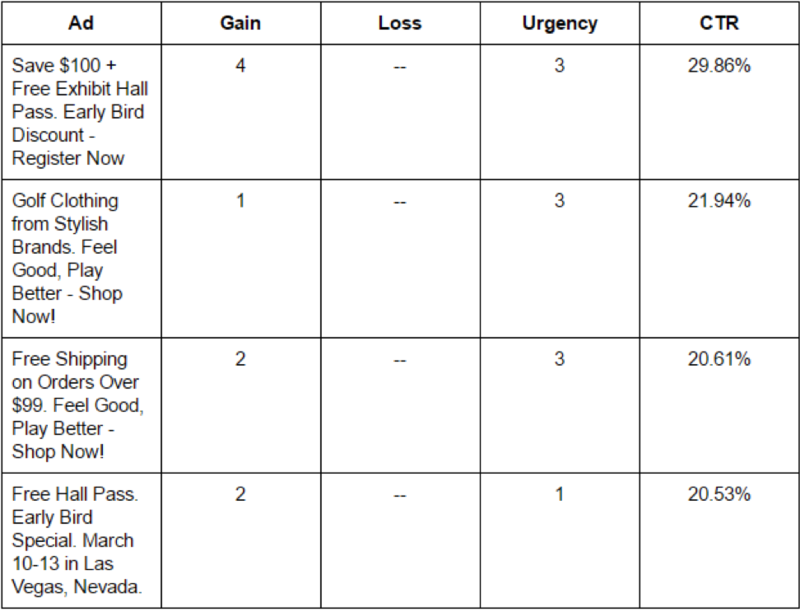 We then manually reviewed each individual ad and assigned values for urgency and gain or loss framing. We decided on a 1-5 scale for Urgency, while allowing for losses to be represented on a scale between -1 and -5, and gains between 1 and 5. While assigning values to our ads, something we thought about was the strength of the words used to indicate urgency, loss, or gains. In essence, our criteria for urgency was whether or not the ads had a specific deadline or offered language that stressed timing. For gains, we looked to see if there was anything ‘extra’ that the users got by clicking the ad; whether it was a limited discount on prices, a deal that lasted only a specific time, or even coupons. For losses, we looked for ads that stressed that the user would no longer have access to the deal after the time frame. We saw the combination of missing out on something with deadlines as one of the main factors in determining how much of a loss the ad was. As a result of all of this, our data is somewhat subjective. 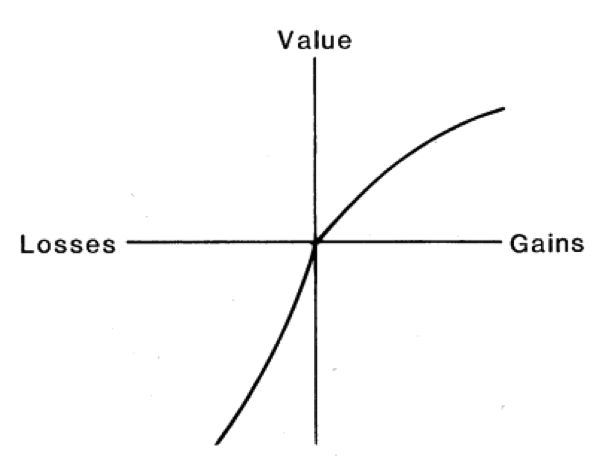 By using Gain/Loss Framing as the X axis and Urgency as the Y Axis, we created the graph seen below. Each point on the graph can be hovered over to find the CTR, the actual ad copy, the number of clicks, and the number of impressions, that the ad received. The only change made is that we have removed all instances of brand names from the ad to keep our client and their services anonymous. The average CTR for a gain-framed ad was closer to 5.20%, whereas loss-framed ads averaged at 3.32%. On average, gain-framed ads in our sample saw 1,126 clicks from 66,277 impressions, whereas loss-framed ads saw averages of 934 clicks from 77,174 impressions. There are also 3 situations in which our data set revealed very few insights. For instance, there are no level 5 gain-framed ads in our sample. There is also only 1 data point for level -3 and -4 loss-framed ads. Despite these hindrances, our sample still revealed some fascinating results. What we discovered is that there is a surprisingly large cluster of ads that are framed as a low gain (1) with moderate urgency (1-3), which may suggest that this is the comfort zone that our analysts mostly write in. These ads made up 24% of our total sample, and had an average CTR of around 4.37%. 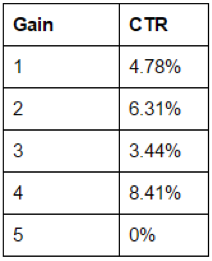 This range of gain and urgency is where we find the 4th highest CTR(20.53%) in our sample, as well. In the table below you’ll find the top 4 performing ads from our sample and their CTR. Interestingly, they were all gain-framed ads with varying degrees of urgency, and the single best performing ad was a very framed with a very high gain to the user. 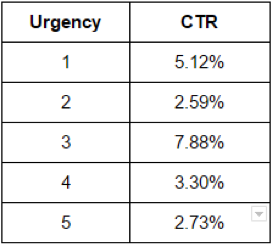 The common feature among the top performing ads is the level of urgency that they each demonstrated — and looking further through the data, ads with a moderate level of urgency (3) tend to have the highest average CTR, at an average of 7.88%. Another interesting result that our data revealed was that there seems to be a point of diminishing returns from phrasing an ad as a strict gain. When controlling for outliers, ads that were rated at a significant gain (4) the CTR was closer to 4% rather than 8.31%. While we would need to expand our sample size to be able to conclusively state that framing an ad as a gain or as a loss will lead to consistent results — what we can say is that from our data set we can easily reject our hypothesis. Simply put, ads framed as a gain, on average, tend to lead to a higher CTR than ads phrased as a loss. It is very likely that Dr. Eric Boyd’s thesis on loss-framed ads tending to lead to a higher CTR only when consumers have increased their level of emotional investment towards the ad may hold the answer. With little to no emotional investment, gain-framed ads tend to perform consistently better. Our data indicates that it can corroborate this claim, and this intuitively makes sense to us. As all of our ads were for items and not for services, we can’t expect that consumers would have had a significantly high level of emotional investment. At most, we can only assume that the level of emotional appeal our ads had is directly related to the amount of savings that the consumer received from particular discounts, or how much the offer is intrinsically worth to the consumer. In essence, there is no way for us to quantify how much emotional appeal our ads had to the consumers who clicked these ads. In conclusion, what we found is that our hypothesis can be rejected. On average, we expect ads that are gain-framed to perform better than loss-framed ads, at any urgency, assuming that there is a low level of expected emotional investment from the consumer. Do you use framing to push your CTRs? Contact us to share your thoughts!